This week, LitWorld kicked off a Global Poem for Change activity in honor of April's National Poetry Month, both in our LitClubs and with students over Skype through our partnership with Skype in the classroom. 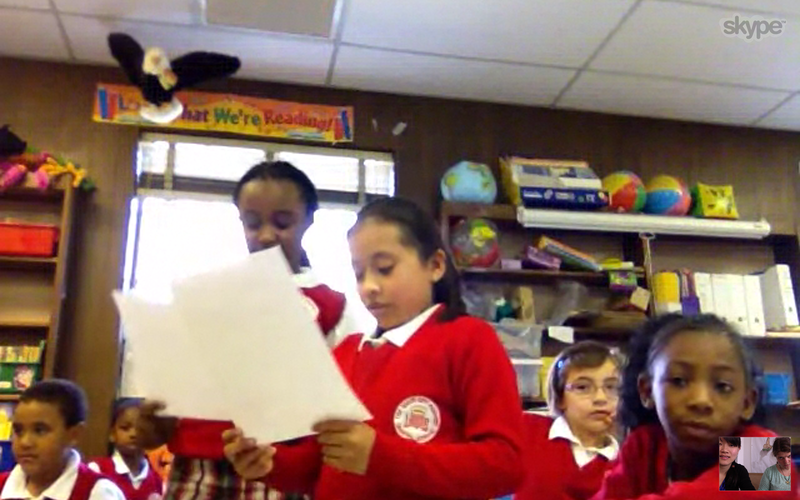 We held our inaugral Skype in the classroom lesson with a grade 3 classroom in Plainfield, New Jersey. We began the lesson with a read aloud of one of our favorite books, "Wangari's Trees of Peace," by Jeanette Winter. As we were reading students jotted down words from the story that stood out for them and used them to create a line of found poetry. We did the same activity in person with our Broadway Housing LitClub in Harlem. One response we loved was this poem written by 7-year-old Abdul: "Raining rivers/ planting green/ green silvery lives/ learned years/ watering lives/ helping far street." Click here to download the lesson plan to use in your classroom, at home or over Skype with friends around the world. We want to add your poetry to the Global Poem for Change we are creating on Storify. Tweet your verse to @litworldsays using hashtag #GlobalPoem.